Even though the relationship between the Apostle Paul and the Corinthians was always a strained one, we know the names of numerous saints at Corinth who were helpful to Paul in his ministry. It is of interest that during the 1929 archaeological excavation of the area near the theater (see here), a plaza was located that contained a stone inscription bearing the name of Erastus and indicating that he was a public official. 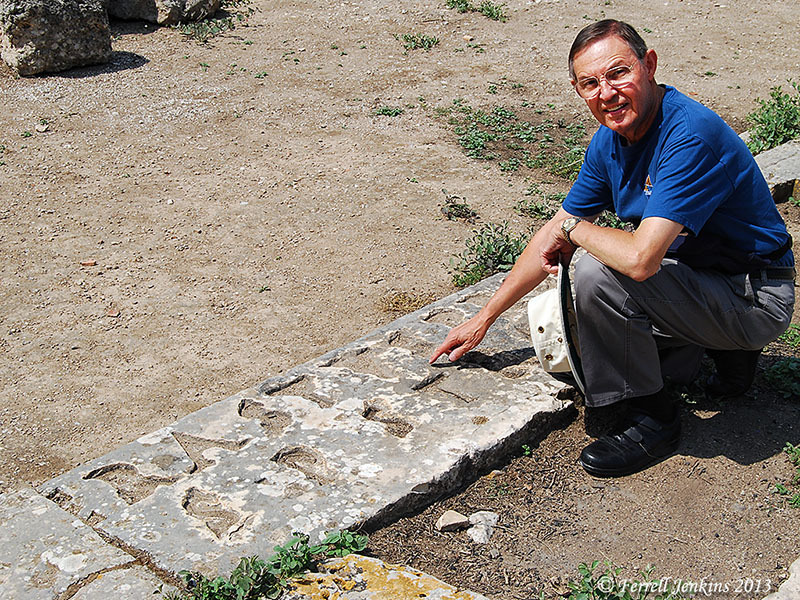 Ferrell Jenkins points to the Erastus Inscription at Corinth. In full: Erastus pro aedilitate sua pecunia stravit. The English translation of the inscription is, “Erastus in return for his aedileship laid (the pavement) at his own expense.” (Archaeology and the New Testament, 331). Originally the letters were filled with bronze, but most of that was removed long ago. The name ERASTVS is seen in the closeup below. The name Erastus in the inscription near the Corinth theater. Photo by Ferrell Jenkins. Are we to identify the Erastus inscription with the Erastus of Romans? It needs to be pointed out that the evidence will not allow a certain identification or a certain rejection. We are not able to answer the question with certainty, but the possibility that this man was among the disciples at Corinth, and a friend of Paul, is intriguing. 14 But when Paul was about to open his mouth, Gallio said to the Jews, “If it were a matter of wrongdoing or vicious crime, O Jews, I would have reason to accept your complaint. 16 And he drove them from the tribunal. The photo below shows the actual platform or bema mentioned in Acts 18. Popular English versions use the terms tribunal, judgment seat, place of judgment, or judge’s bench. 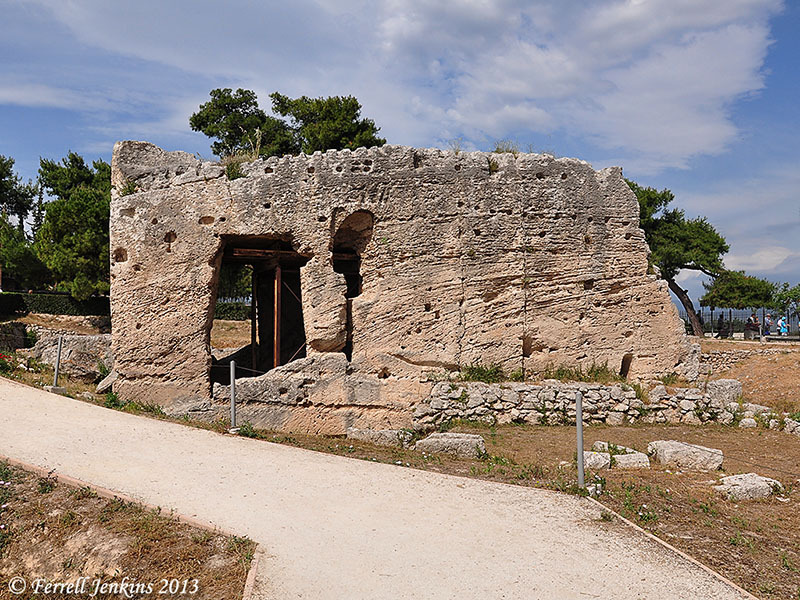 The bema in the agora of Corinth. Photo by Ferrell Jenkins. The bema dates to A.D. 44, but could be as early as the time of Augustus (Murphy-O’Connor, St. Paul’s Corinth, 28). An inscription found at Delphi names Gallio the proconsul of Achaia. Gallio was the brother of the famous Roman Stoic philosopher Seneca. Gallio’s terms as proconsul of Achaia is usually dated to either A.D. 51/52 or 52/53. This is an important chronological help in our study of Paul’s journeys. 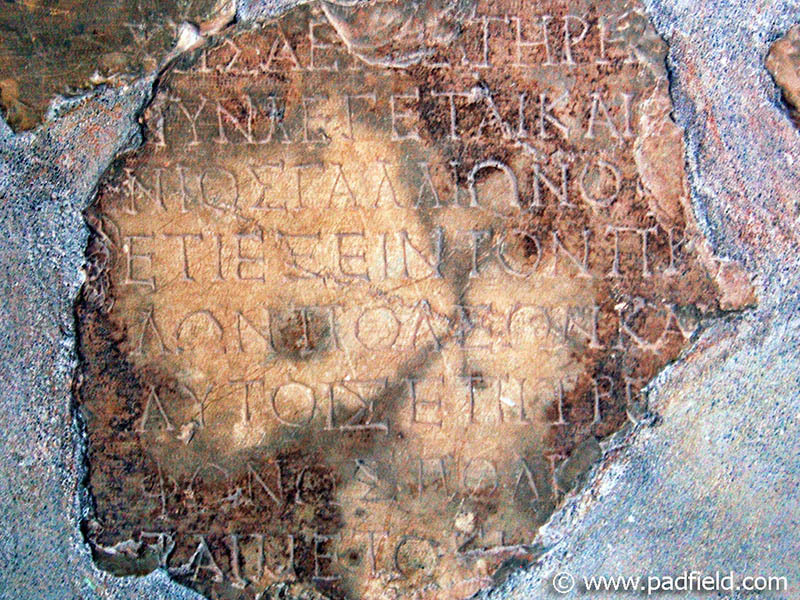 In the largest fragment of the inscription, the name of ΓΑΛΛΙΩ (GALLIO) may be seen in the center of the third line from the top. The Delphi (Gallio) inscription. Photo by David Padfield. I have been to Delphi at least two times, but the broken pieces of the Gallio Inscription were in a storage room. I did have written permission to see the fragment, but the slides I made were of poor quality. Thanks to David Padfield for permission to use the nice photo above which is now displayed in the museum at Delphi. 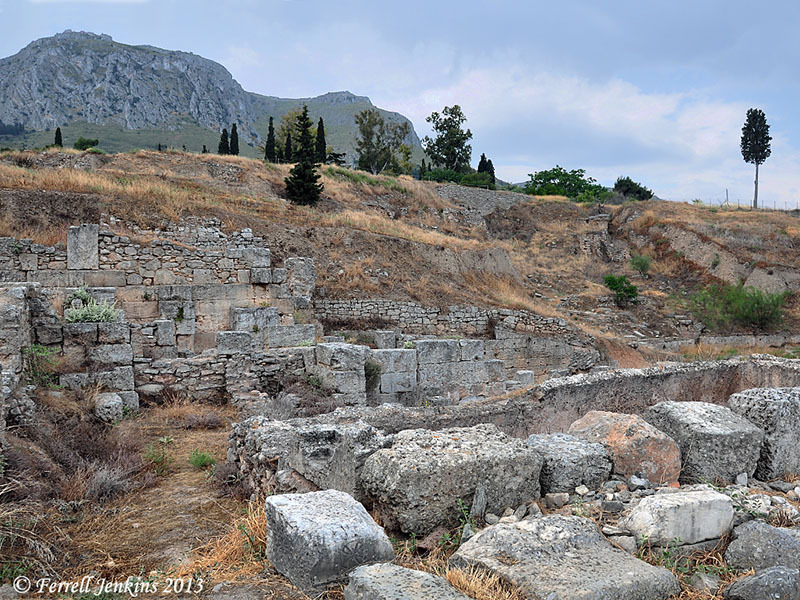 Ruins of the theater at Corinth. Photo by Ferrell Jenkins. The theater is not on the typical tourist route at Corinth, but it can be reached along a rugged path north of the major excavated area. The Apostle Paul spent 18 months among the Corinthians. 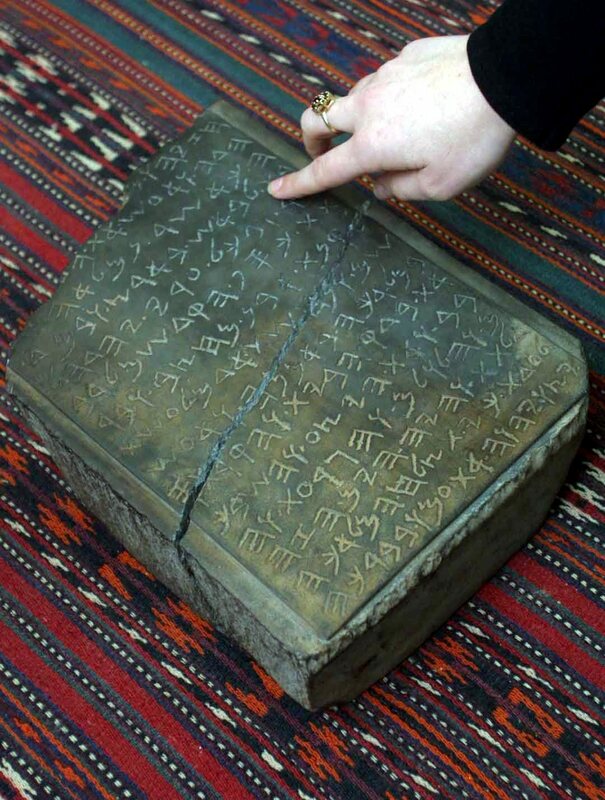 The Supreme Court of Israel ordered that the Jehoash Tablet, a 9th century inscription about repairs to the temple in the days of King Jehoash of Judah, must be returned to the owner. The Jerusalem District Court had earlier ruled that he state had not proved that this inscription was a forged document. Chiseled in ancient Hebrew and dated to the ninth century BCE, the tablet describes renovations of the First Temple – which is said to have been built by King Solomon – ordered by Jehoash. It corresponds to the account in II Kings 12:1-17, in which the king laments the state of the temple and commands that money the priests collect from the people be used to fix it up. Read the account in today’s Haaretz here. Matthew Kalman has been keeping abreast of this decade-long case and reports at Bible and Interpretation here. Like the James Ossuary, we will probably never know if this document is authentic. Gordon Franz sent me the report on his recent visit to southeastern Turkey and the “International Noah and Judi Mountain Symposium.” He said, “If you want to post it on your site, you are more than welcome.” This is an issue of much importance, and I am delighted to share it with our readers and help give it wide distribution. Twice I have visited Eastern Turkey. In 2007 I was aware of the argument for Cudi Dagh (or Mount Judi), but was advised by my Turkish tour operator not to go to the mountain. Still hopeful of seeing the mountain someday. The “International Noah and Judi Mountain” symposium was held in Sirnak, Turkey, under the auspices of Sirnak University. One of the purposes of this conference was to set forth the case for Cudi Dagh, the mountain just to the south of Sirnak, as the landing-place of Noah’s Ark in South East Turkey. This mountain is not to be confused with the (late) traditional Mount Ararat, called Agri Dagh, in northeastern Turkey. 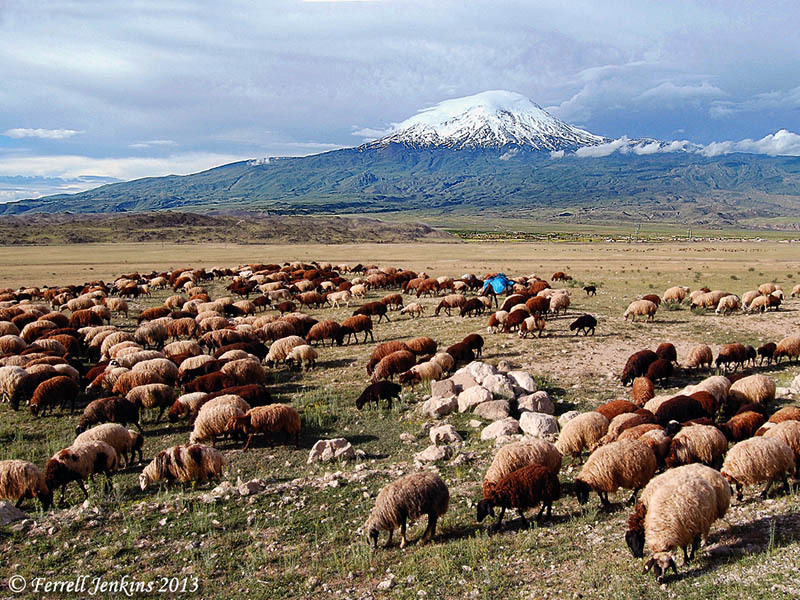 Traditional Mount Ararat (Agri Dagh) in north eastern Turkey. Photo by Ferrell Jenkins. Interestingly, at this conference I learned of another mountain that allegedly Noah’s Ark landed on. It is located at Mount Gemikaya in Azerbaijan. By my count, that is the sixth mountain vying for the honors of this historical event: two in Turkey, three in Iran, and one in Azerbaijan. The Iranian and Azerbaijani sites are far outside the Land of Ararat / Urartu, and in the case of the Iranian sites, deep inside the Land of Media. We can safely dismiss these mountains as the place where Noah’s Ark landed according to the Bible. To be truthful, Agri Dagh must be dismissed as well because it is a post-Flood volcanic peak in a plain, and not within the “mountains (plural) of Ararat” (Gen. 8:4). 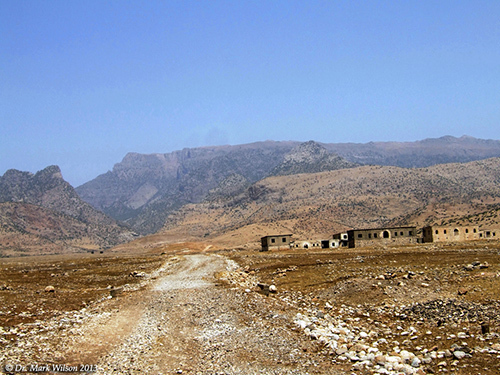 The symposium was held at the Sehr-I Nuh Otel (translation: Noah’s City Hotel) in Sirnak, just north of Cudi Dagh (Cudi or Judi Mountain). This mountain is within the “mountains of Ararat” (Gen. 8:4) where Noah’s Ark landed. The facilities at the hotel were first class, the food was absolutely delicious, and we had a spectacular view of Cudi Dagh from the panorama view windows as we ate our meals. Cudi Dagh (Mount Judi). Photo courtesy of Dr. Mark Wilson. Special thanks goes to Dr. Mehmet Ata Az, a philosophy professor at Sirnak University, for coordinating the speakers and making sure our needs were met. He truly has a servant’s heart and our best interest in mind. Thank you my friend! At this point Gordon gives a synopsis of select papers, including his own on the topic, “Did Sennacherib, King of Assyria, Worship Wood from Noah’s Ark? Read the report in its entirety at Gordon’s Life and Land Seminars site. I think you will be profited, and perhaps enlightened, by doing so. To the west of the temple [of Apollo] and on a lower level lies the Fountain of Glauke, supplied with water by a conduit from the Acrocorinth, virtually nothing of which remains except four reservoirs cut in the rock. It was named for the legendary daughter of a king of Corinth who threw herself into its waters to escape the flames of the magical robe sent her by Medea. Originally the fountain was covered by a building approximately 45 feet long and 40 feet wide. (A Guide to Biblical Sites in Greece and Turkey, 59). The Fountain of Glauke at Corinth. Photo by Ferrell Jenkins. 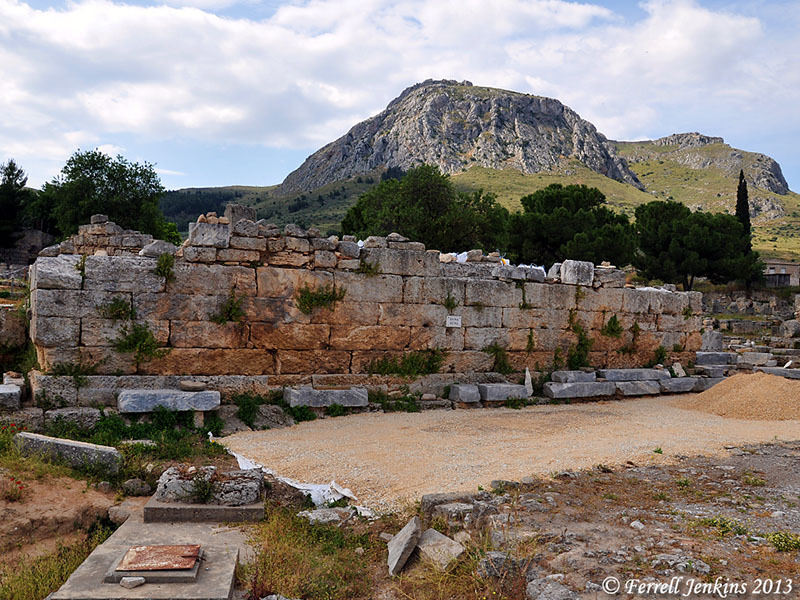 Among the Christians at Corinth during the time of the Apostle Paul, we can certainly imagine that some of them visited these sites we have learned about as a result of the archaeological excavations over the past century. See Acts 18; 1 Corinthians; 2 Corinthians. This is a brief follow-up on our report here of the vandalization of the Protestant Cemetery. Trent Dutton, “Our man in Jerusalem”, reports that once AP released a story about the vandalism, several Middle East and American news outlets have come to the cemetery for photographs, and have re-posted the story. The aerial photo below shows the Church of the Dormitian, the Catholic, Armenian, and Greek cemeteries in the upper left portion. 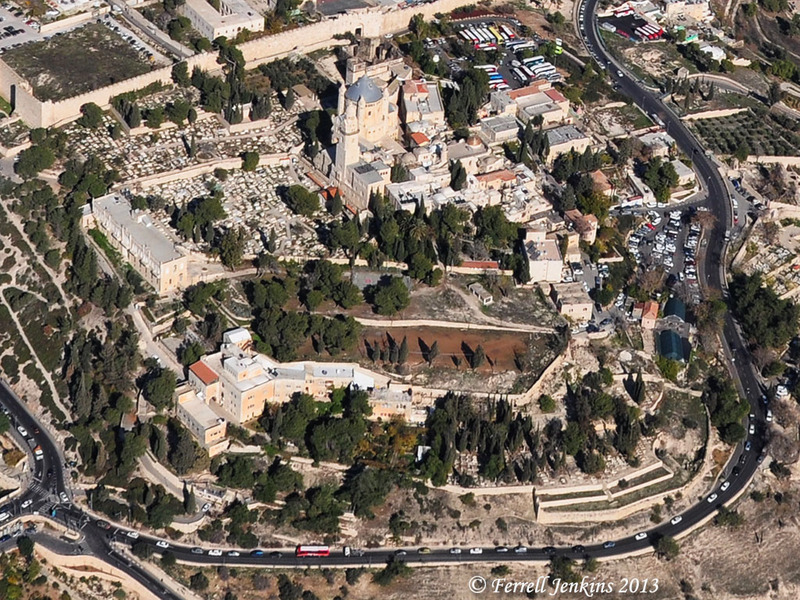 Along the bottom of the photo, overlooking the road along the south of the Old City where it joins with the Hebron Road, is the Jerusalem University College. The Protestant Cemetery can be seen among the trees just above our copyright notice. Click on the photo for a larger image. Aerial photo of the Protestant Cemetery. Photo by Ferrell Jenkins. You can probably see that it would be rather easy for one to enter the cemetery from the road below.